Calling all female entrepreneurs in Vancouver and the Lower Mainland! 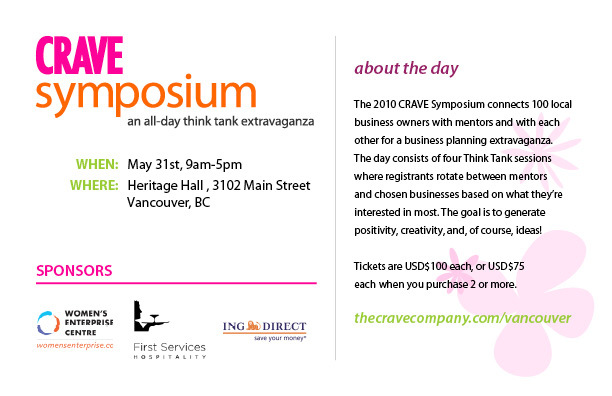 CRAVE Vancouver will be hosting an all-day think thank event for business owners of all levels. Here's your chance to meet mentors, network with peers, share stories, and walk out of the symposium a more inspired and enlightened businesswoman. Additionally, CRAVE is holding a contest and choosing 8 lucky business owners from the retail, product, service, and online sectors to be "think-tanked" for the day. This is a unique opportunity, so don't miss out! For more information or to purchase tickets, check out their website. This is great - ladies connecting and networking. I would love to go! that sounds great...can't wait to hear about it! Sounds so cool. Wish I could go there. Vancouver is so freaking cool!